INQUEST warmly invites you to a half-day conference held in the North where we will look at issues concerning Inquest funding, practice and procedure. Specialist inquest practitioners, including Deborah Coles, Director of INQUEST, Joanne Kearsley (Senior Coroner, Greater Manchester North), Pete Weatherby QC (Garden Court North Chambers), Kate Stone (Garden Court North Chambers), Gemma Vine (Minton Morrill), Anna Morris (Garden Court Chambers), Leanne Devine (Broudie Jackson Canter) and Matthew Standbury (Garden Court North Chambers), will cover a wide range of the current key issues in inquest law, procedure and practice, including a roundtable discussion about Exceptional Case Funding for Inquests, Case Law update, Multi-Agency/Homicide deaths engaging Article 2 and Mass Casualty events. The Conference will be followed by the “Quiz up North”. Make a saving by purchasing a place on the conference and a ticket for the Quiz at the same time. The quiz will take place from 7pm – late. *enter YLAL in place of firm/chambers at checkout if you are a Young Legal Aid Lawyer but not ILG member. All proceeds go to INQUEST and will help to support our vital work. 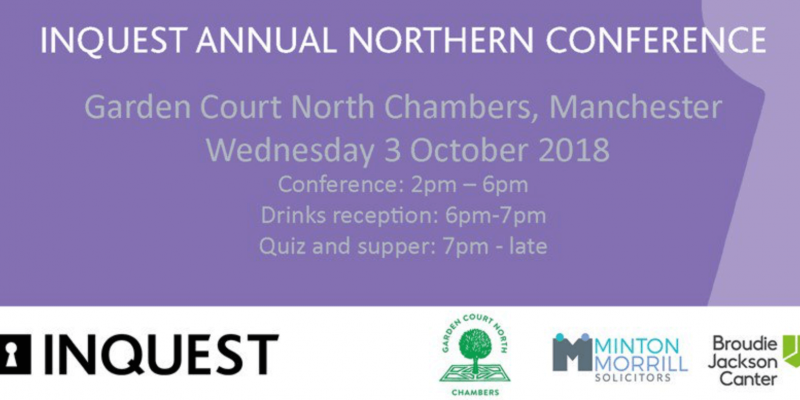 Drinks and refreshments will be provided courtesy of Garden Court North Chambers, Minton Morrill and Broudie Jackson Canter during the Conference and the Quiz.